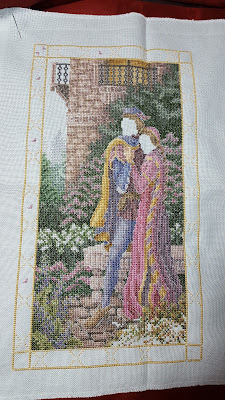 I've finished all the cross stitching. 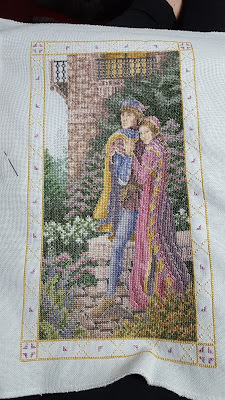 A close up of the faces before backstitching. 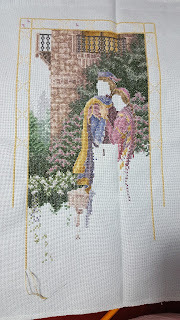 I've gotten most of the border done, but I realized when I went to get a new length, I used the wrong color for the castle. So now I get to frog all of that. Page 3 reminded me why I do parking with confetti heavy pieces. Damn you ninja stitches! I realize the sweater is a knit pattern, but I am going to teach myself to knit. Eventually... And the dragons are no background so I can use pretty dyed fabric and they should take less time. Now to decide if I want them on the same fabric or coordinate per dragon. 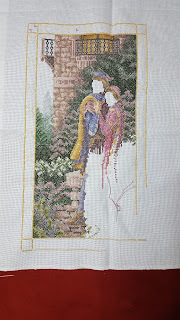 Why am I still stitching green? I switched from Insanity because of the green, but I'm still doing green. At least I can intersperse it with another color. I'm getting near the bottom of my fabric. Apparently, I miscalculated my margins when I started this piece. I will have far less on the bottom than the top, but at least I won't be short. And my rose bush is in bloom again. For once, it didn't get buried under a pile of snow for months.